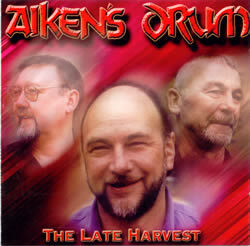 Our first CD entitled "The Late Harvest" was released in December 2001 and can be ordered by clicking here or at the bottom of the page. The price is £7.50 including packing and postage within the UK;extra postage will be applied to orders from abroad. By clicking the music icons in the table, you can download and immediately play short clips (MP3) from all the tracks. The traditional song tracks can be ordered individually (in MP3 or WMA format) by clicking here or on the song links below. For those visitors using a Windows operating system who like gimmicks, you can see a copy of the CD actually "playing". You can watch this Flash Movie and also hear a 50 second clip of "The Isle of St Helena" (698 Kb) by clicking here.